There are two main choices for chains or rope: twist link chain or Technora. We use stainless steel chains, swivels, and split rings for the greatest strength and durability. Twist link chain is a strong chain option, and feels slightly smoother when spinning than materials such as ball chain. This chain catches on itself slightly when it tangles which makes moves like Hyperloops easier. We add a ball bearing swivel just above the poi head to minimize chain twist, and use heavy duty stainless steel split rings (far stronger than normal keychain split rings; nearly impossible to open without “split ring pliers") to connect chains to swivels and quick links. Technora is the latest innovation in leash science. All sizes have a melt point of 932 degrees F. The smallest size we carry has a minimum strength of 2500 lbs which is over 10 times that of link chain. Technora leashes will be +/- 1/4" of the overall length requested. Our handle choices include: Double Fingerloop, Single Loop, and PomGrips. Single Loop Handles have a single large cotton loop that partially inverts to tighten on two fingers more snugly than double fingerloop handles can. 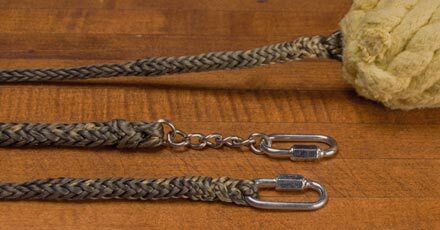 *NOTE When measuring overall length, single loop handles are considered ~2" shorter when we build leashes to account for the reduced length that happens when you invert them to put them on. PomGrips are silicone-formed handles made by LanternSmith. They come in a wide variety of colors and can be weighted for tossing. If a swivel is desired, PomGrips can either have the swivel sticking directly out of the bottom or can have a short Technora leash with the swivel attached to the end for alternative grip styles. Overall Length is the entire length of the poi leash setup, including hardware, leashes, and handles.